Backed by rich industry experience and market understanding, we are involved in offering a wide array of Wet Dry Bulb Thermometer to our valued patrons. We offer Wet & Dry Bulb Thermometer, Zeal, UK.We are engaged in exporting a wide range of Dry and Wet Bulb Thermometer. 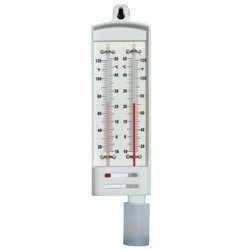 These Dry and Wet Bulb Thermometers are provided with mercury filled imported glass and white back thermometers, fixed on metal scale. Mounted on polished wooden base, with screen-printed markings and figures. Range -20 to +50×1°C and 0to 120°Fx2°F, red spirit filled. These thermometer registers high & low temperature reading with special indices from last setting point, mounted on seasoned plastic base & boxed with specially designed magnet. Thermometer register High & Low temperature reading. We are dedicatedly engaged in manufacturing a commendable range of Dry Bulb Thermometer. Our organization is passionately engaged in offering an exclusive array of Whirling Thermometer to the customers at very affordable rates within committed period of time.